Native American Religion is a vast subject that covers the religious beliefs, rituals, ceremonies and practices of the indigenous people of North America. Native American religion is characterized by the religious belief that spirits are present in all things, both animate and inanimate. The Native American religion and religious beliefs are centered around the environment and the natural world of animals, birds, insects, plants, herbs and trees, natural phenomena such as rocks, mountains, rivers, lakes, and clouds and celestial bodies such as the sun, moon, planets and stars. 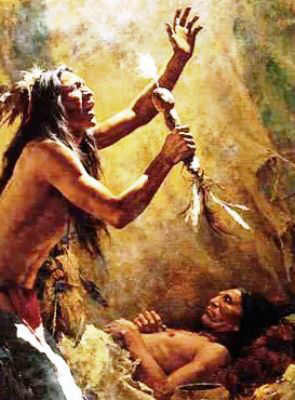 In Native American religion lies the belief that the living are intimately connected with the souls, or spirits, of the dead. Spirituality features in Native American Religion in which beliefs or religious practices are based on communication with the spirit world through mediums known as a Shaman or Medicine Man, who also acted as healers. The are many stories, legends and myths about the Creator who is generally referred to as the Great Spirit. American Indian religion and beliefs were highly localized according to the traditions of different tribes so that it is not possible to fully define Native American Religion. It can only be explained by describing the beliefs, religious practices, ceremonies and rituals that featured prominently in their belief systems. Native American religion uses help and guidance from the spirit world in order to treat the whole person - the mind, body and spirit. The following list describes many of the beliefs and religious practises that feature in American Indian religion. Great Spirit: The Great Spirit is the supreme being and principal deity of Native American Indians. Animism: Animism is a religious belief that all natural objects within the universe, have souls or spirits. It is believed that spirits exist not only in humans but also in animals, plants, trees, mountains rocks etc. Herbalism and Spiritual Healing: Herbalism is a traditional medicinal practice based on the use of herbs, plants and plant extracts as the source of healing remedies. The use of herbs is combined with Spiritual Healing to treat the whole person - the mind, body and spirit. Animal Spirit - Spirit Guide: An Animal Spirit, or spirit guide, walks through life with a person, teaching and guiding them, and in some instances protecting them. Medicine Bag: A Medicine Bag was a special, sacred container for various objects, or amulets, of supernatural power used by a Shaman, to carry 'medicine', or symbols, of animal spirits good luck, protection and strength in battle. Smudging Ritual: Smudging is a traditional Native American method of burning sacred herbs to produce a smoke cloud which is used in various cleansing or prayer ceremonies and purification or healing rituals. Vision Quest - Spiritual Journey - Trance State: A Vision Quest is an attempt to achieve a vision of a future guardian spirit through the process of fasting, isolation and meditation. A Vision Quest or Spiritual Journey was sometimes accompanied by the inducement of a Trance State for the purpose of attaining guidance or knowledge from supernatural forces or spirits. Totemism: Totemism was practiced by Northwest Indian tribes and centered around the belief of having a natural object or animate being, such as as a bird or animal, as the emblem of a family, clan, or tribe. Kiva: A Kiva is a special sacred building, usually built underground, that is used for spiritual ceremonies, religious rituals and ceremonial preparations by the Pueblo Native Americans and strongly associated with the Kachina belief system. Prayer Stick: A Prayer Stick is used to make offerings and petitions to the spirit world. Prayer Sticks are most often associated with rituals relating to religious ceremonies particularly of the Southwest Native American tribes.